Where are his shoes or sandals, this is strange. 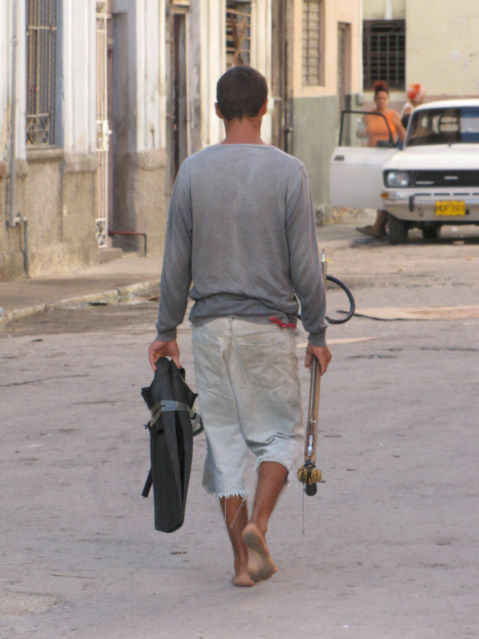 This man is walking from the Centro Habana area towards the Gulf of Mexico with snorkeling gear and a spear gun. Generally, Cubans where shoes, they do not where sandals, it is more of gym shoe country, often people have on dress shoes. However, they are not opposed to walking around with no shirt, no shoes, there is no problems. I find this curious, I was in Haiti for about five days with Andy, and I know most of Central and South America. Generally, people feel obliged to wear shoes and a shirt. By some quirk of Cubans have no social stigma associated by not wearing shoes. There are 100’s of people sitting on the stoops in front of their homes, old men with no shirts. I have tried to take photos of them daily; however, it is a difficult photo. To photograph a person who is not looking is rather easy, but to take a photo of a person looking right at you is Paparazzi arrogant. This is the photographer’s dilemma, a person has to weigh the value of the photo, and to point a camera right at person is bad manners. To make a person the single subject of a photo is a problem. The person can get angry, and maybe should. People who are sitting on stoops in front of their house are looking around, they never stop looking around, and that is the purpose of sitting on a stoop. They are usually aware I am standing around with a Camera, they are watching me.